Rain is returning to the New Orleans metro area this week bringing the possibility of severe storms and hail. It’s too early to get an exact forecast for Mardi Gras parades this week -- which kicks off with Nyx on Wednesday -- but there’s a chance of rain daily through Sunday. Rain is returning to the New Orleans metro area this week bringing the possibility of severe storms and hail. It’s too early to get an exact forecast for Mardi Gras parades this week, which kick off with Nyx on Wednesday, but there’s a chance of rain daily through Sunday. The National Weather Service in Slidell said clouds will return Monday (Feb. 25) and a warm front will bring rain overnight and Tuesday. Isolated severe storms are possible Tuesday. The biggest risks, forecasters said, are wind gusts in excess of 60 mph, hail and isolated tornadoes. See the parade schedule for this week and weekend. Here’s the weekly forecast from the National Weather Service. Monday: Increasing clouds, with a high near 65. At night, a 40 percent chance of showers after 1 a.m. Cloudy, with a low around 55. Tuesday: A 60 percent chance of rain. Cloudy, with a high near 67. New rainfall amounts between a quarter and half of an inch possible. At night, 60 percent chance of rain. Cloudy, with a low around 62. Wednesday (Nyx): A 50 percent chance of showers and thunderstorms. Mostly cloudy, with a high near 75. At night, a 50 percent chance of rain. Patchy fog after 7 p.m. Mostly cloudy, with a low around 63. Thursday (Muses): A 60 percent chance of showers. Cloudy, with a high near 76. At night, 60 percent chance of rain. Patchy fog after 7pm. Otherwise, mostly cloudy, with a low around 64. Friday (Hermes): A chance of showers and thunderstorms. Patchy fog before 11 a.m. Otherwise, mostly cloudy, with a high near 75. At night, a chance of showers and thunderstorms. Mostly cloudy, with a low around 63. Saturday (Iris, Endymion): A chance of showers and thunderstorms. Mostly cloudy, with a high near 70. At night, a chance of showers. Mostly cloudy, with a low around 48. Sunday (Bacchus): A chance of showers. Mostly cloudy, with a high near 56. 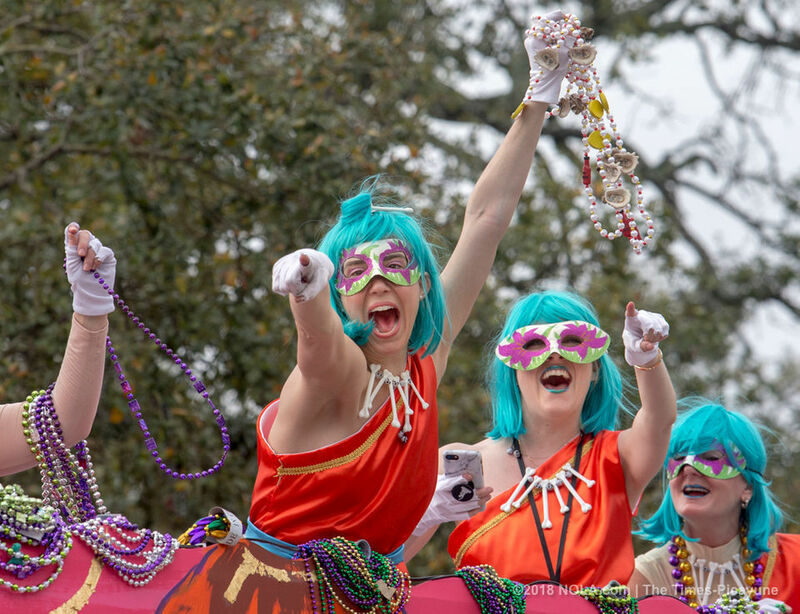 Here are the times and maps of all the parades before Lundi Gras.